I got this recipe from Katie at Chocolate Covered Katie. I have made a few changes but be sure to check out here recipe as well. In another bowl, combine oats, honey, and peanut butter. 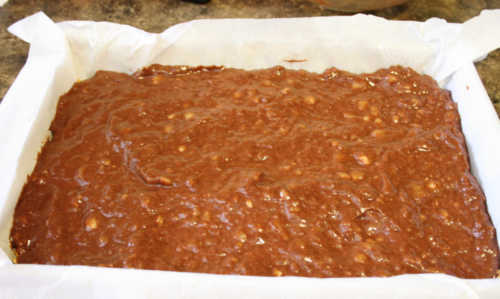 Mix well then spread half of the mixture into the bottom of a pan lined with parchment paper. (The pan shown in the photo is 7in x 11in but any small pan of similar size will work just fine). The mixture is fairly sticky so a sprayed a spatula with non-stick cooking spay and used that to spread the oats and press them flat. It worked like a charm. Next is the banana and chocolate layer. See all those banana chunks. 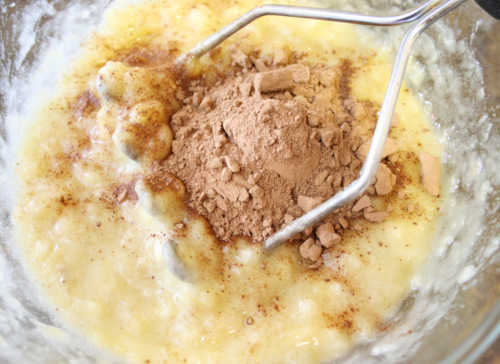 You can combine the bananas and coco powder in the blender if you prefer a smoother texture. Now you can add the rest of your oat mixture. 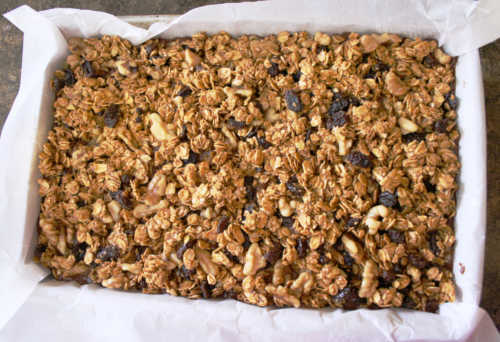 I mixed in some raisins and walnuts which is completely optional but in my opinion, the bars taste so much better with them. Once you are done, cover your pan with plastic wrap or slide it into a large ziploc bag and set them in the freezer overnight. Line pan with parchment paper. Set aside. Mash bananas and coco powder together. Set aside. In a separate bowl mix quick oats, honey, & peanut butter. 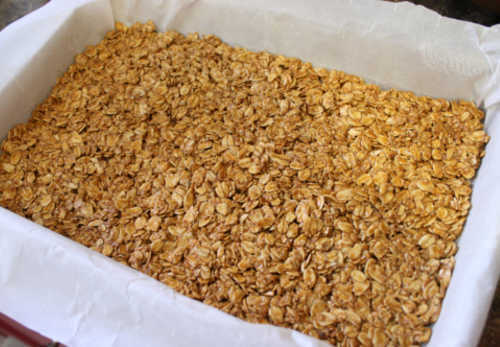 Spread half of your oat mixture into the bottom of your pan. Press the mixture down flat to form a solid layer. Spread your banana mixture on top of your oatmeal layer. If desired, add raisins and walnuts to the remaining oat mixture. 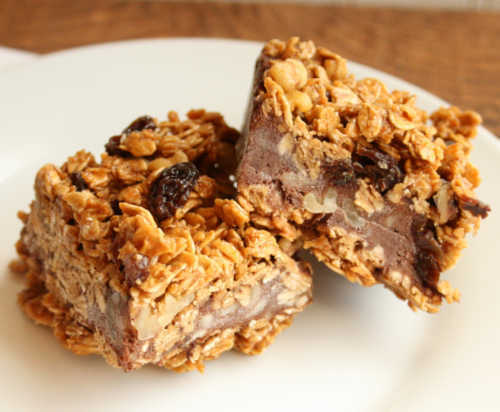 Spread the remaining oat mixture on top of your chocolate layer. Place in freezer overnight or until firm. 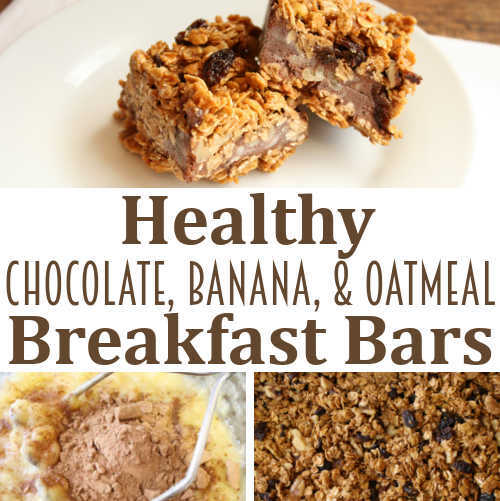 Cut into bars and enjoy. Store remaining bars in freezer.